Cambridge Public School supports the idea of"Healthy mind exists in Healthy body." We believe that every child has "a right to play". For a healthy mind and body, one needs to exercise and stay fit on a regular basis. Physical education develops a sense of fair play and team spirit in the students. the school provides a variety of games and sports, such as hockey, basket-ball, Badminton, Volley Ball, Athletics, Martial Arts. A physical fitness programme of morning PT, Yoga, Meditation is provided for the day scholars during their time in school. 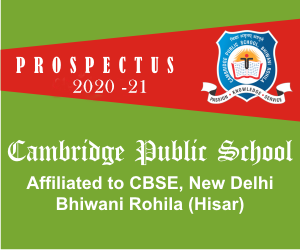 The school has outdoor facilities of Cricket, Hockey, Volleyball, Handball, Kho-Kho and Athletics.